Learning to recognize notes on the staff is a necessary part of playing music from sheet music. We created some flashcards to help new learners memorize the names of the notes on the staff. The templates below are made to print easily on home or office printers. They are completely free to use and share (not for re-sale). On this page, you'll be able to download samples of each flash card collection. To download the full package for free, sign up for a Lessonface account here. 1. Choose the version(s) of flashcards below that is(are) best for you. 2. Print out the pages on your home or office printer. Use regular 8.5 x 11 paper. 3. Fold the pages long-ways, and cut across the dotted lines. 1. The original. For piano. Bass and treble clefs with keyboards, and with bonus time value of notes cards. One side shows the notes on the treble and bass clefs. The other side shows the note name and where it can be found on the piano keyboard relative to middle C. This set also includes flashcards for time value of notes (whole/ half/ quarter/ eighth/ sixteenth). 10 pages; 39 flashcards. Bass and treble clefs without keyboards. Also includes time value of notes. This template includes the notes on the bass and treble staffs, and also the time value of notes cards. It differs from the "Original" flashcards by not having the keyboards. 10 pages; 39 flashcards. This set only contains the treble clef notes. There are no keyboards, and no time value of notes cards. 5 pages; 17 flashcards. Learn to recognize the notes on the guitar. Also includes basic chords and common key signatures for guitarists. 4 pages; 20 flashcards. 5. Time value of notes only. Contains the time value of notes: whole note, half note, quarter note, eighth note, sixteenth note. (These cards are also included in versions 1 & 2 above). 2 pages; 5 flashcards. The cards are part of the new guitar flash cards, and are included with the guitar set (#4 above). Two pages; 10 flashcards. 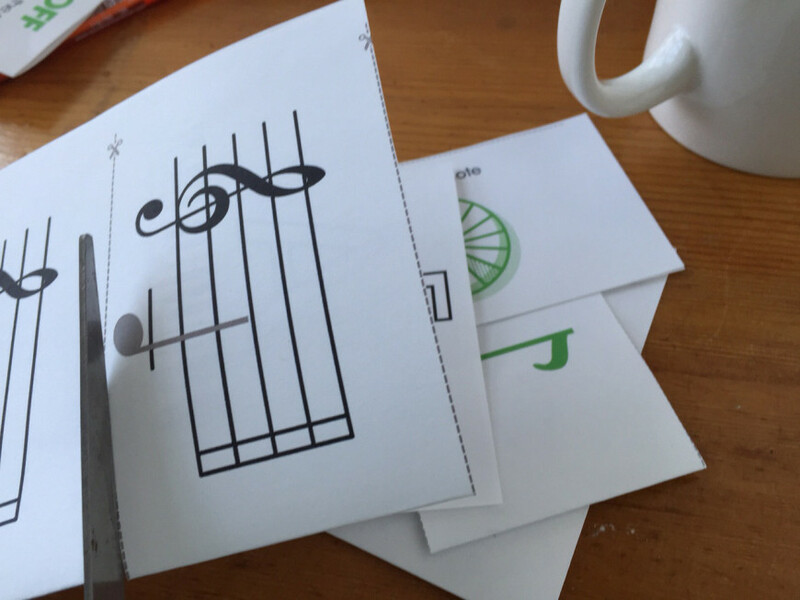 How to Begin Reading Piano Music, by Liz Turner -- this article inspired the creation of these flash cards!